a superb south-facing terrace with great views, next to the pistes. Near the Les Menuires bus station, the restaurant enjoys a location which is both ‘near everything’ yet far from the bustle of the resort. Open from nine a.m., it serves non-stop until eleven p.m. Dish of the day, pizzas made from fresh ingredients, regional specialities and traditional menu: something to satisfy the largest of appetites ! In the evening, enjoy in the fireplace, savoyard specialties and excellent pizzas followed by a dessert house. A nice souvenir of your stay, complete with a génépi offered by the boss. The dining establishment with fireplace welcomes throughout the winter season families and groups of friends for a convivial and tasting. A rich and varied menu is offered. The foie gras and smoked salmon plate are trying. In the afternoon or any time of the day, enjoy the view of the surroundings to enjoy pancakes, churros and all hot and cold drinks. In the evening, go down one floor, the Kube welcomes you! Be transported into a festive universe. Tapas Lounge Bar with up to 22h and "front box" with DJ until 2am make one of the places connected to the station. - Caters for 74 guests. -Located to the right of the ‘skier’s bridge’. - 80-seater terrace by the pistes. 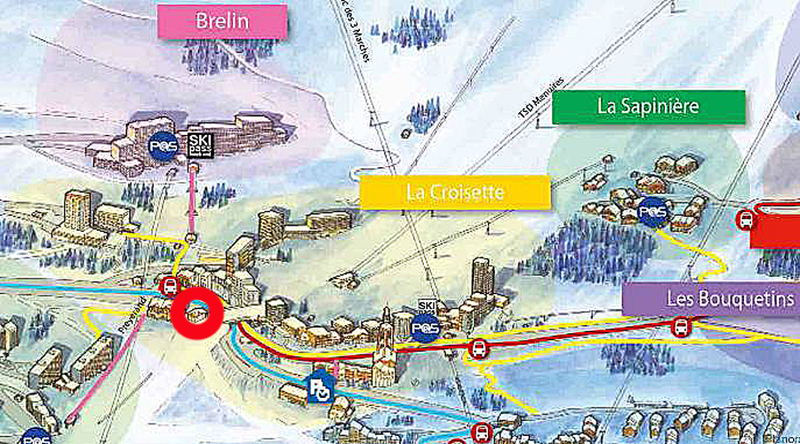 - Access: ski-in, on foot, by road. - Pizza to take away. - Pre-club Bar Lounge DJ.